"DTW" redirects here. For other uses, see DTW (disambiguation). Detroit Metropolitan Wayne County Airport (IATA: DTW, ICAO: KDTW, FAA LID: DTW), usually called Detroit Metro Airport, Metro Airport, or just DTW, is a major international airport in the United States covering 4,850 acres (1,960 ha) in Romulus, Michigan, a suburb of Detroit. 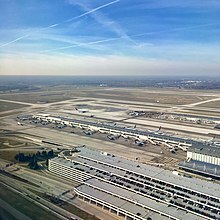 It is Michigan's busiest airport, and one of the largest airline hubs in the country. The Federal Aviation Administration (FAA) National Plan of Integrated Airport Systems for 2017–2021 categorized it as a large hub primary commercial service facility. The airport is Delta Air Lines' second-largest hub in terms of total operations. Detroit serves as the primary gateway to Asia for the Eastern United States for Delta and is also the third-busiest gateway to Europe for the airline. The airport is a major gateway for tourism in metropolitan Detroit and is one of SkyTeam's major Midwestern hubs. 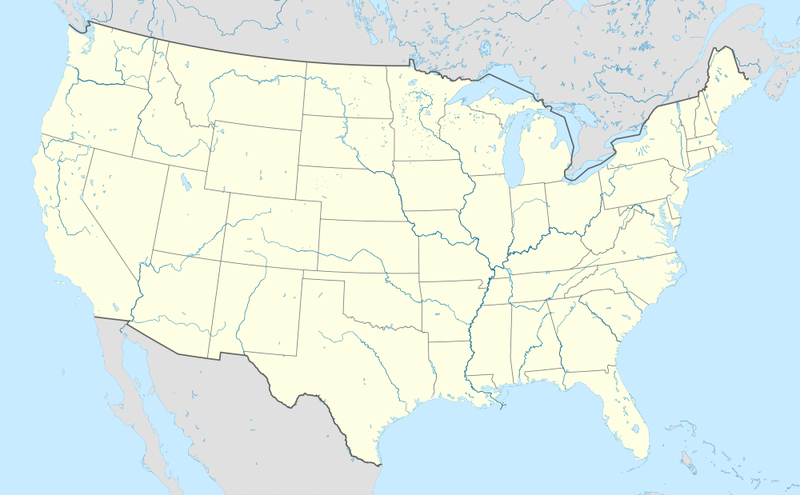 It is also the fourth-largest base for Spirit Airlines and is a major connecting point between the Eastern and the Western United States. The airport has service to 30 international destinations and service to 39 states across the United States. Operated by the Wayne County Airport Authority, the airport has four main runways, two crosswind runways, two terminals (McNamara Terminal and North Terminal), and 129 in-service gates. McNamara Terminal has three concourses (A, B, and C), while North Terminal has one (D). Concourse A in McNamara Terminal, at nearly 1 mi (1.6 km) in length, is the second-longest airport concourse in the world (the longest is in Terminal 1 of Japan's Kansai International Airport). An on-site Westin Hotel and conference center is connected to Concourse A. Detroit Metropolitan Airport has maintenance facilities capable of servicing and repairing aircraft as large as the Boeing 747-400. In 2016, Detroit Metropolitan Wayne County Airport was the 18th-busiest airport in the United States. In terms of aircraft operations (takeoffs and landings), the airport was 18th-busiest in 2013. Metro Airport primarily serves the Metropolitan Detroit area, Toledo, Ohio, area, approximately 40 miles (64 km) south of the airport, the Greater Ann Arbor, Michigan area, which is west of the airport, and the city of Windsor, Ontario and Southwestern Ontario in nearby Canada. The airport serves over 140 destinations and was named the best large U.S. airport in customer satisfaction by J.D. Power & Associates in 2010. Wayne County began to plan an airport in the western townships of the county as early as 1927. The following year the county board of commissioners issued a $2 million bond to fund the purchase of one square mile (2.6 km2) of land at the corner of Middlebelt and Wick roads, the northeastern boundary of today's airport. Construction was completed in 1929, and the first landing was on February 22, 1930; Wayne County Airport was dedicated on September 4, 1930. That year Thompson Aeronautical Corporation, a forerunner of American Airlines, began service from the airport. 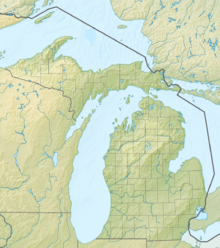 From 1931 until 1945 the airport hosted Michigan Air National Guard operations gained by the United States Army Air Forces. It was named Romulus Field during the war; it was then all east of Merriman Road and north of Goddard Road. Between 1947 and 1950 the county expanded the airport to become Detroit's primary airport. It renamed the facility Detroit-Wayne Major Airport in 1947, and in the next three years expanded threefold as three more runways were built. In 1949, the airport added runways 3L/21R and 9L/27R, followed by runway 4R/22L in 1950. In 1946–47, most airline traffic moved from the cramped Detroit City Airport (now Coleman Young International Airport) northeast of downtown Detroit to the larger Willow Run Airport over 20 miles (32 km) west of the city, and 10 miles (16 km) west of Wayne County Airport. Pan-Am (1954) and BOAC (1956) were the first passenger airlines at Detroit-Wayne Major. In the April 1957 Official Airline Guide, they were the only passenger airlines: three Pan Am DC-7Cs per week FRA–LHR–SNN–DTW–ORD and back, and one BOAC DC-7C per week LHR–PIK–YUL–DTW–ORD and back (skipping YUL on the return flight). Aerial photographs of DTW from 1949 and 1956 show the airport's expansion. American Airlines shifted to Detroit-Wayne in October 1958, followed by Northwest, Allegheny and Delta in the next few months. In 1958, the Civil Aviation Administration—now the Federal Aviation Administration (FAA)—announced the inclusion of Detroit-Wayne in the first group of American airports to receive new long-range radar equipment, enabling the airport to become the first inland airport in the United States certified for jet airliners. Also in 1958, airport management completed the L.C. Smith (South) Terminal and gave the airport its present name. Jet flights (Pan Am and American 707s) began in 1960. Northwest's flights to the Minneapolis-Saint Paul International Airport [MSP] were DTW's only nonstops west beyond Chicago and Milwaukee until 1966, when the remaining passenger airlines at Willow Run moved to Metro Airport. The North Terminal (later renamed the Davey Terminal) opened in 1966 and a third terminal, the Michael Berry International Terminal, opened in 1974. The last of its original three parallel runways (3R/21L) was completed in 1976. A new parallel crosswind runway (9R/27L) opened in 1993. Republic Airlines began hub operations in 1984, and its merger with Northwest Airlines in 1986 expanded the hub. Transpacific flights began in 1987, with Northwest providing nonstop service to Tokyo. 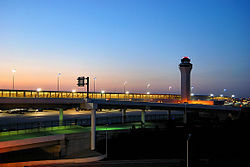 The last of Metro's six runways (4L/22R) was completed in December 2001 in preparation for the opening of the mile-long, 122-gate, $1.2 billion McNamara Terminal in the airport midfield in 2002. The airport remained a hub for Northwest Airlines until it merged with Delta Air Lines. The present Runway 3L/21R has had four identifiers. When opened in 1949, it was Runway 3/21. With the opening of the new west side Runway 3L/21R in 1950, the original 3/21 became 3R/21L. With the opening of the new east side Runway 3R/21L in 1976, it became 3C/21C. With the opening of Runway 4L/22R in December 2001 and the splitting of the field into two sectors (3/21 on the east and 4/22 on the west), Runway 3C/21C became Runway 3L/21R. In 2009, Detroit Metro Airport launched its first social media efforts with participation in Twitter, Facebook, and YouTube networks. Detroit was a major hub for Northwest Airlines from 1986 to 2010. Northwest Airlines later merged with Delta Airlines, and Detroit became Delta's second largest hub. In April 2011, Lufthansa launched a unique curbside check-in and baggage check service for premium customers from DTW's North Terminal to Frankfurt and beyond. Lufthansa became the only airline allowing international customers departing from DTW to check their bags and receive a boarding pass at the curb, while DTW becomes Lufthansa's first North American gateway with this service. Detroit's economy fell greatly to the Great Recession, causing airlines such as British Airways to drop flights to London–Heathrow and other airlines such as KLM Royal Dutch Airlines and Virgin Atlantic to utilize codeshare flights through Delta Air Lines. While the city has lost population, Detroit Airport has since re-grown, and airlines are looking to expand or begin service once again. JetBlue Airways began flights to Boston in February 2014. United Airlines resumed nonstop flights to San Francisco in June 2017 in efforts to boost competition in Detroit. Spirit Airlines has also grown in the Detroit market, adding service to more East and West Coast cities. Spirit has increased their market share to over 10%, widening the gap as Metro Airport's 2nd largest carrier. Royal Jordanian was the first airline to schedule the Boeing 787 Dreamliner into Detroit, on December 1, 2014. One of Delta Connection carriers, Compass Airlines chose to close its operating base in Detroit to move operations to the new Seattle hub in early 2015. Delta has replaced many of the existing Compass flights with mainline Delta flights to allow SkyWest Airlines and GoJet to open Detroit bases. Beginning in January 2018, Suburban Mobility Authority for Regional Transportation, or SMART Bus, began providing a direct connection from the airport to the Rosa Parks Transit Center in downtown Detroit via route 261, also known as the Michigan Ave FAST bus, with stations at both the McNamara and North terminals. On June 26, 2015, Spirit Airlines announced the construction of a new maintenance facility on the airport. The airline stated this facility would bring $31.5 million and 82 jobs to the Metro Detroit area. Spirit Airlines had a hangar that closed, forcing the airline to do maintenance at the gate with contract workers. With the new facility, which opened in May 2017, Spirit will retain its operating base at Metro Airport, and bring additional air service. Spirit was also the first airline to regularly fly the A320neo in the US, the first route was Detroit to Los Angeles as well as add self-tagging luggage kiosks at DTW. In 2017, WOW Air announced new service to Reykjavik using the Airbus A321 aircraft. The short six hour flight allowed the airline to do so. This marked the first ever entrance of a modern European low cost carrier to DTW. In summer of 2018, Reykjavik went from the 55th most traveled destination to 5th due to this flights popularity. Connecting opportunities were also present in Reykjavik, boosting travel to popular European destinations. In March 2019, however, the airline ceased operations, leaving Metro Airport with no low cost nonstop service to Europe. The airport is currently looking for replacement service to begin in 2020. The Airport Authority's long-term plans include a bus transportation system to a light rail station north of the airport proposed by the RTA, expansions and re-surfacing of runways to accommodate the Airbus A380, as well as vendor, security checkpoint and terminal expansions. The bus route would connect the existing terminals to a light rail station north of the airport via bus with an anticipated consolidated rental car facility and a planned regional rail system. Also, the airport is considering the expansion of both ends of Concourse D as well as expand or relocate security checkpoints to meet tomorrow's travel needs. There are several options for the expansion of the North Terminal to meet the demands of airlines, which include expanded ticket counter space, expanded or centralized security, and the option of expanding the north or south ends of the terminals to add an additional 5 gates. The McNamara terminal includes expanded ticket counter space, centralized security and node upgrades or expansions in Concourse C.
Goals are to include better connectivity to the Middle East, India, and nonstop flights to several key destinations in Europe, Latin America, and Asia. This addition would add to the airport's four existing parallel runways and its two crosswind runways in order to alleviate future congestion. The Regional Transit Authority is planning mass transit from Detroit to a rail connection point just north of the airport, in an effort to make transportation quicker and easier. The planned SEMCOG Commuter Rail system, with terminals at Ann Arbor and Detroit, would stop at the airport and provide rail transportation to and from the city. Because the line will use existing infrastructure, it will not directly serve the airport, but connect via shuttle. The planned airport station will be approximately 5 miles (8.0 km) north of the airport. Whether the RTA or SEMCOG plan ends up being adopted is still unclear. According to the most recent version of the master plan, the current FAA tower will be replaced with a new tower located near the site of the demolished Smith Terminal. Recent findings of mold and other fungi inside the current tower have accelerated the current towers useful life, allowing the FAA to plan construction of the new tower once the final phase of the former Smith terminal completes demolition. A view of the southern portion of DTW’s McNamara Terminal and its parking garage. DTW has 4 concourses with a total of 129 gates. The McNamara Terminal, also once known as the Northwest WorldGateway, opened February 25, 2002. Designed by SmithGroup and built by Hunt Construction Group, it replaced the aged Davey Terminal. During development, the terminal was known as the Midfield Terminal. The terminal is used exclusively by Delta (which merged with Northwest), and Delta partners Aeromexico and Air France. This terminal has three concourses, A, B, and C, which house 103 gates with shopping and dining in the center of A concourse (known as the Central Link), as well as throughout the concourses. It houses three Delta Skyclubs located throughout Concourse A, and 1 located in Concourses B and C. At nearly 1 mi (1.6 km) in length, Concourse A in McNamara Terminal is the second-longest airport concourse in the world (the longest is in Terminal 1 of Kansai International Airport in Japan). In addition to moving walkways spaced along the length of each concourse, Concourse A has a people mover, the ExpressTram. It transports passengers between each end of Concourse A in just over three minutes. Trams arrive almost simultaneously at the Terminal Station, in the midpoint of the concourse and depart in opposite directions to the North Station and the South Station, then return. The McNamara Terminal opened a new baggage sorting facility in October 2008, which has improved the screening of baggage through 14 new explosive detection system devices along a fully automated conveyor system. Northwest Airlines said that it reduced the amount of lost baggage, and it improved the timeliness of bags getting to their correct flight. DTW McNamara Concourse A and Westin Hotel. An AAA Four Star Westin hotel is connected to the A concourse. Additionally, overnight guests at the hotel who are not flying can obtain a pass to enter the concourses to visit shops and restaurants. Called the Airport Access Authorization to Commercial Establishments Beyond the Screen Checkpoint (AAACE), registered guests must be cleared through the same security background check (Secure Flight) and TSA screening process as travelers to access the terminal area. Dallas-Fort Worth International Airport is the only other airport participating in this program. The A concourse houses 62 gates with 12 gates used for international departures and arrivals processing. The A concourse is intended for all aircraft. At the midpoint of the concourse is a large, laminar flow water feature designed by WET. The concourse contains over 1.5 miles (2.4 km) of moving walkways. The A concourse also includes a pet relief area for passengers traveling with pets and service animals. Signage through the terminal is in English, along with Japanese due to the large number of business travelers from Japan. Izumi Suzuki, a Sheraton employee, and several colleagues provided the Japanese translations used by the airport. In previous eras many Japanese travelers going through Detroit missed connections due to a lack of English comprehension. Also, messages reminding travelers to configure watches to the Eastern Time Zone regularly broadcast through the public address system are said in English, Japanese, and Mandarin. In addition to the ticketing level, there's an additional ticketing and security area for passengers using the parking structures. The terminal houses ten international gates that are capable of dual jet bridge loading and unloading. The gates contain two exit configurations depending on the arriving flight. Domestic arrivals follow an upper path directly into the terminal while international arrivals proceed downstairs to customs and immigration screening. The Customs and Border Protection processing center located in the terminal's lower level is designed to accommodate as many as 3,200 passengers per hour. International arriving passengers connecting to another flight are screened by TSA at a dedicated screening checkpoint within the international arrivals facility. Those passengers then exit directly back into the center of the A concourse. Passengers arriving from international destinations who end their trip in Detroit (or connecting to a flight via North Terminal) exit directly into a dedicated International Arrivals Hall on the lower level of the terminal. The B and C concourses currently have 41 gates that are used for Delta's regional flights that employ smaller aircraft. All regional flights have jet bridges, eliminating the need for outdoor boarding. The B and C concourses are connected to the main terminal building and the A concourse by a pedestrian walkway under the Airport ramp. This walkway, known as the Light Tunnel, features an elaborate multi-colored light show behind sculpted glass panels extending the entire length of the walkway, as well several moving walkways. The light patterns are synchronized with an original musical score composed by Victor Alexeeff, which runs for nearly 30 minutes before repeating. This installation, one of the first large-scale uses of color changing LED lighting in the United States, was produced by Mills James Productions with glasswork by Foxfire Glass Works of Pontiac, Michigan. The display won multiple lighting design awards including the prestigious Guth Award of Merit. For passengers who are prone to medical conditions such as seizures, there are buttons at each end of the tunnel that will suspend the light show for five minutes so they can pass through with no adverse effects. The terminal has undergone updates that include new electronic terminal directories to better assist passengers. A unique feature of this is that passengers can scan their boarding passes, and the screen will direct them to the gate from which their plane departs. The passenger can also choose to view the information in other languages. Passengers may select a restaurant on the touch screen and a menu will show what items the restaurant serves. Mini tablet devices and phone/tablet apps have been installed in food court areas, where travelers may order food and have it delivered to their table. The North Terminal, designed by Gensler and built by Walbridge/Barton Malow Joint Venture, opened September 17, 2008, as the replacement for the aged Berry and Smith terminals, which housed all non-SkyTeam airlines. Initially, Wayne County Airport Authority sought bids for the naming rights of the North Terminal. After two years with no successful offers, however, the effort ceased and the North Terminal name remained. The terminal currently houses all non-SkyTeam airlines serving the airport, and is considered D Concourse. 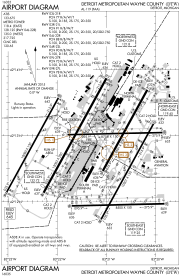 (Concourses A, B, and C are housed in the McNamara Terminal) The concourse has 26 gates, two of which opened in the middle of 2009 to accommodate international wide-body aircraft. The two gates were unusable at the building's opening because they were extremely close to Smith Terminal's C concourse, which was demolished after operations moved to the new facility. The terminal features four long segments of moving walkways on the departures level, and another moving walkway on the lower level; that is for international arriving passengers to access the Federal Inspection Services area. Airlines that utilize the North Terminal include; Air Canada, Alaska, American, American Eagle, Frontier, JetBlue, Lufthansa, Royal Jordanian, Southwest, Spirit, United, United Express, and all non-SkyTeam and non-Delta partner charters. The North Terminal houses two six-lane security checkpoints. The terminal also has U.S. Customs & Border Protection inspection facilities located on the lower level for arriving international flights. The North Terminal includes a Lufthansa club, located at the south end of the D Concourse near gate D4. Also, this terminal includes a brand new service pet relief area to accommodate passengers traveling with pets. The North Terminal has five common-use domestic baggage carousels on the lower level. Two additional carousels are located inside the Federal Inspection Services area for international flights, and a central Oversize Baggage Claim is adjacent to both the international and domestic carousel areas. 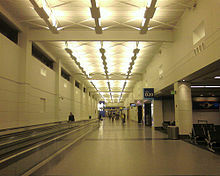 January 29, 2010, the North Terminal was named winner of the "Build Michigan" award project. ^1 Royal Jordanian operates flights to and from Detroit year round. The airline operates nonstop service to Amman in the summer months. In the fall, winter, and spring months, however, the flight makes a stop in Montréal–Trudeau. Royal Jordanian does not have fifth freedom rights to transport passengers solely from Detroit to Montreal. The McNamara Terminal Parking Structure is an 89-acre (36 ha), 10-level facility, which opened in February 2002. It is one of the largest parking structures in the world and includes a ground transportation center, pedestrian bridge, luggage check-in locations. The structure can accommodate 11,489 cars. Parking for the North Terminal is offered in a garage known as the Big Blue Deck. One additional surface lot, named the Green Lot serves as overflow parking. A second surface lot, the Yellow Lot closed April 5, 2012. The airport is accessible from Interstate 94 (I-94) by taking exit 198 to Merriman Road, which is the closest entrance to the North Terminal, and from I-275 via Eureka Road, which is closer to the McNamara Terminal. John D. Dingell Drive, named after long-time Congressman, is an expressway built in 1999 to access the McNamara Terminal and connects the I-94 and Eureka Road entrances of the airport. Most major rental car companies serve the airport through shuttle busses to offsite locations. The Michigan Flyer provides bus service between the airport and Ann Arbor, Jackson, and East Lansing eight times daily. Terminal To Terminal shuttles provide free transport between the McNamara and North Terminals. Robert Q. Airbus also provides independent shuttle services to destinations in Southern Ontario, and most hotels located within the airport perimeter provide their own shuttle services as well. The McNamara and North Terminals also have cell phone lots. June 12, 1972, after a stopover in Detroit, American Airlines Flight 96, a McDonnell Douglas DC-10-10 with 56 passengers and 11 crew from Los Angeles International Airport en route to Buffalo, New York, suffered a cargo door failure and explosive decompression shortly after departure from Detroit Metropolitan Airport while flying over Windsor, Ontario. It is thus sometimes referred to as the Windsor incident. The aircraft sustained damage that left the pilots without full flight controls but the plane returned to Detroit for a successful emergency landing. There were no fatalities but several serious to minor injuries. July 31, 1972, Delta Air Lines Flight 841; members of the Black Liberation Army took over the airplane in flight using weapons smuggled on board, including a Bible cut out to hold a handgun. The plane held 7 crew and 94 passengers, none of whom was killed during the hijacking. Five hijackers who had boarded with three children took over the plane. The plane flew to Miami where the passengers were exchanged for $1 million in ransom. The plane was then flown on to Boston where it refueled before flying to Algeria. Algeria seized the plane and ransom, which they returned to the U.S. but the hijackers were released after a few days. March 4, 1987, Northwest Airlink Flight 2268, operated by Fischer Brothers Aviation, a CASA 212 was on a scheduled flight from Mansfield to Detroit with an intermediate stop in Cleveland when it crashed while landing at Detroit Metropolitan Wayne County Airport. The plane yawed violently to the left about 70 feet (21 m) above the runway, skidded to the right, hit three ground support vehicles in front of Concourse F and caught fire. Of 19 occupants onboard (16 passengers and 3 crew), 9 were killed. The cause of the crash was determined to be pilot error. August 16, 1987, a McDonnell Douglas MD-82 operating as Northwest Airlines Flight 255, bound for Phoenix, Arizona, crashed on take-off from Metro's 8,500-foot-long (2,600 m) Runway 3 Center (Now Runway 3L). All but one passenger on the aircraft were killed; the lone survivor was a young girl, Cecelia Cichan, who lost both of her parents and her brother. The NTSB determined that the accident resulted from flight crew's failure to deploy the aircraft's flaps prior to take-off, resulting in a lack of necessary lift. The aircraft slammed into an overpass bridge on I-94 just northeast of the departure end of the runway. December 3, 1990, a McDonnell Douglas DC-9-14 operating as Northwest Airlines Flight 1482, bound for Pittsburgh, collided with a Boeing 727-200 Adv. operating as Northwest Airlines Flight 299, bound for Memphis, on runway 03C. Seven passengers and a flight attendant on Flight 1482 were killed. The cause of the accident is listed as "pilot error". January 9, 1997, an Embraer EMB 120 Brasilia aircraft operating as Comair Flight 3272 crashed nose down 18 miles (29 km) from the airport while on approach into Detroit. All 26 passengers and 3 crew members were killed. The cause is listed to be the "FAA's failure to establish adequate aircraft certification standards for flight in icing conditions, the FAA's failure to ensure that an FAA/CTA-approved procedure for the accident airplane's deice system operation was implemented by U.S.-based air carriers, and the FAA's failure to require the establishment of adequate minimum airspeeds for icing conditions." March 21, 2001, a Airbus A320-212 operating Northwest Airlines Flight 985, bound for Miami, overran Runway 03C during takeoff and came to a stop at the muddy terrain. All 145 passengers and 6 crew escaped the plane unharmed. December 25, 2009, Nigerian national Umar Farouk Abdulmutallab attempted to detonate an explosive device on Northwest Airlines Flight 253, an Airbus A330 from Amsterdam to Detroit as the plane was approaching Detroit. The device failed to go off correctly, and the suspect suffered burns to his lower body. Three other passengers had minor injuries. The White House said it considered the incident an attempted terrorist attack. 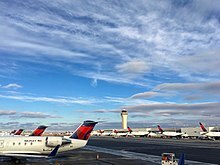 ^ "Detroit Metropolitan Wayne County Airport - Delta News Hub". news.delta.com. Retrieved November 27, 2017. ^ "Airport Statistics 2018". Wayne County Airport Authority. 2018. Retrieved February 4, 2019. ^ FAA Airport Master Record for DTW (Form 5010 PDF), effective March 1, 2018. ^ "Comprehensive Financial Report for the year ended September 30, 2011" (PDF). Wayne County Airport Authority. January 20, 2012. p. 69. Archived from the original (PDF) on June 1, 2012. Retrieved January 10, 2013. ^ "List of NPIAS Airports" (PDF). FAA.gov. Federal Aviation Administration. October 21, 2016. Retrieved November 23, 2016. ^ "Detroit Metropolitan Wayne County Airport". Delta News Hub. Retrieved January 13, 2016. ^ "Minneapolis-St. Paul International Airport". Delta News Hub. Retrieved January 13, 2016. ^ "Welcome to Detroit Metro Airport". Wayne County Airport Authority. Retrieved January 10, 2013. ^ "Annual Report for the period ending 12/31/11" (PDF). Spirit Airlines. February 23, 2012. Retrieved January 10, 2013. ^ a b "Press Room: Facts". Wayne County Airport Authority. Archived from the original on January 20, 2013. Retrieved January 10, 2013. ^ "Detroit Metropolitan Airport, Twin Bay Boeing 747 Hangar". Walbridge Construction. Retrieved January 10, 2013. ^ "Aircraft Movements 2013 FINAL (Annual)". Airports Council International. December 22, 2014. Retrieved August 7, 2017. ^ "Travel Tips & Security Information: FAQ-Directions". Wayne County Airport Authority. Archived from the original on February 24, 2009. Retrieved January 10, 2013. ^ Pawlowski, Agnes (February 24, 2010). "Detroit Tops Airport Satisfaction Study". CNN. ^ Meyer, Zlati (August 31, 2014). "This week in Michigan history: Detroit's airport is dedicated". Detroit Free Press. Retrieved September 3, 2014. ^ "Detroit-area aerial pics". Wayne State University. Retrieved September 14, 2012. ^ a b c "Detroit Metropolitan Wayne County Airport Chronological History". Wayne County Airport Authority. Archived from the original on February 4, 2009. Retrieved January 10, 2013. ^ Christoff, Chris (October 18, 1984). "Republic will make Metro its major hub". Detroit Free Press. p. A-3. Retrieved April 22, 2018 – via https://www.newspapers.com/. ^ "Airline offers link to flight to Tokyo". Battle Creek Enquirer. April 11, 1987. p. 6B. Retrieved April 22, 2018 – via https://www.newspapers.com/. ^ Creager, Ellen (May 16, 2011). "Northwest Airlines Artifacts Soar in Value". USA Today. Retrieved January 10, 2013. ^ "Lufthansa Launches Curbside Check-In Service at Detroit Metropolitan Airport" (PDF) (Press release). Wayne County Airport Authority. Archived from the original (PDF) on July 22, 2012. Retrieved January 10, 2013. ^ Cardenas, Edward (December 1, 2014). "Metro Airport Welcomes Its First Boeing 787 Flight". WWJ-TV News. Retrieved May 13, 2015. ^ Abdel-Razzaq, Lauren (April 3, 2015). "Delta feeder airline shuttering Detroit crew base". The Detroit News. Retrieved July 3, 2017. ^ "SMART Unveils New Service!". Suburban Mobility Authority for Regional Transportation. December 27, 2018. Archived from the original on February 3, 2018. Retrieved January 4, 2018. ^ Reindl, JC (June 26, 2015). "Detroit Metro Airport to get new hangar, 80 jobs". Detroit Free Press. Retrieved June 27, 2015. ^ Master Plan Update (PDF). Wayne County Airport Authority. June 2016. Retrieved August 7, 2017. ^ "Detroit Metro Airport Master Plan" (PDF). Wayne County Airport Authority. 2002. Archived from the original (PDF) on February 27, 2009. Retrieved January 10, 2013. ^ "Detroit Proposes 10,000-Foot Runway, Would Displace 15% of Town". USA Today. Associated Press. February 22, 2008. Retrieved January 10, 2013. ^ "$4.6B transit plan would connect Detroit, 4 counties". Detroit Free Press. May 31, 2016. Retrieved July 3, 2017. ^ Perkins, Tom (January 31, 2010). "Ann Arbor to Detroit Rail Could Be Running By Year-End, Officials Say". Ann Arbor News. Retrieved January 10, 2013. ^ Keraghosian, Greg (January 21, 2016). "Airports You'll Enjoy Being Stranded at During Winter Storm Jonas". Yahoo!. Archived from the original on October 11, 2018. Retrieved October 11, 2018. ^ "Osaka Kansai International Airport". Skyscanner. May 31, 2018. Archived from the original on October 11, 2018. Retrieved October 11, 2018. ^ a b "McNamara Terminal Map" (PDF). Wayne County Airport Authority. Archived from the original (PDF) on February 27, 2009. Retrieved January 10, 2013. ^ "Detroit (DTW) McNamara Terminal Northwest World Gateway Baggage Handling System" (PDF) (Press release). BNP Associates. Archived from the original (PDF) on March 15, 2013. Retrieved January 10, 2013. ^ Hurst, Nathan (March 20, 2009). "New, Faster Baggage Screening". The Detroit News. Retrieved January 10, 2013. ^ "Privacy Impact Assessment for the Airport Access Authorization To Commercial Establishments Beyond The Screening Checkpoint (AAACE) Program" (PDF). Department of Homeland Security. April 5, 2007. Retrieved January 10, 2013. ^ "Water Feature". Wayne County Airport Authority. Retrieved August 30, 2015. ^ "McNamara Terminal Restaurants, Shops and Services". Wayne County Airport Authority. Archived from the original on February 2, 2013. Retrieved January 10, 2013. ^ Wuebker, Marcus (November 18, 2008). "The McNamara Tunnel, Detroit Airport". JimOnLight.com. Retrieved January 10, 2013. ^ Gordon, Guy (November 23, 2015). "Detroit Metro Airport (DTW) has variety of new food choices". WDIV News. Retrieved August 4, 2017. ^ "Detroit Metropolitan Airport". Gensler. Retrieved January 10, 2013. ^ Shea, Bill (July 27, 2010). "Detroit Metropolitan Airport Calls Off Plan to Sell Naming Rights". Crain's Detroit Business. Retrieved January 10, 2013. ^ "North Terminal Restaurants, Shops and Services". Wayne County Airport Authority. Archived from the original on February 2, 2013. Retrieved January 10, 2013. ^ "Detroit Metro Airport's North Terminal Named 'Build Michigan' Winner" (Press release). redOrbit. February 1, 2010. Retrieved January 10, 2013. ^ a b "Flight Schedule". Aeroméxico. Retrieved April 5, 2017. ^ "Aeroméxico anounces route Guadalajara-Detroit" (in Spanish). EnElAire. December 2018. Retrieved December 12, 2018. ^ "Aeroméxico and Delta anounce new route to Detroit" (in Spanish). EnElAire. December 2018. Retrieved December 4, 2018. ^ "Flight Schedules". Air Canada. Retrieved April 5, 2017. ^ "Horaires". Air France. Retrieved April 5, 2017. ^ "Flight timetable". Alaska Airlines. Retrieved April 5, 2017. ^ a b "Flight schedules and notifications". American Airlines. Retrieved April 5, 2017. ^ "Delta further expands Detroit flights to the West with new nonstop service to Sacramento | Delta News Hub". News.delta.com. Retrieved November 17, 2018. ^ "Delta resumes Detroit – Honolulu from late-June 2019". Routesonline. Retrieved November 17, 2018. ^ a b "Flight Schedules". Delta Airlines. Retrieved April 5, 2017. ^ "Delta will restart Bangor-to-Detroit service in June". Bangor Daily News. Retrieved March 5, 2019. ^ "route map". Frontier. Retrieved April 5, 2017. ^ "JetBlue Airways Timetable". Retrieved December 12, 2018. ^ "Timetable". Lufthansa. Retrieved April 5, 2017. ^ "Route Map". Royal Jordanian Airlines. Retrieved April 5, 2017. ^ "Check Flight Schedules". Southwest Airlines. Retrieved April 5, 2017. ^ "Where We Fly". Spirit Airlines. Retrieved April 5, 2017. ^ a b "Timetable". United Airlines. Retrieved April 5, 2017. ^ "Detroit, MI: Detroit Metro Wayne County (DTW)". Bureau of Transportation Statistics. January 2017. Retrieved December 14, 2018. ^ "BTS Air Carriers: T-100 International Market (All Carriers)". Bureau of Transportation Statistics. Retrieved June 16, 2016. ^ Wayne County Airport Authority, . Accessed February 4, 2019. ^ "Aviation Statistics". Wayne County Airport Authority. ^ "Parking: North Terminal". Wayne County Airport Authority. Archived from the original on February 2, 2013. Retrieved January 10, 2013. ^ "Parking: Overview". Wayne County Airport Authority. Archived from the original on January 15, 2013. Retrieved January 10, 2013. ^ "Maps and Directions". Wayne County Airport Authority. Archived from the original on February 17, 2009. Retrieved January 10, 2013. ^ "Express bus service links Detroit's downtown to airport". Detroit News. December 28, 2017. Retrieved January 5, 2018. ^ SMART. "Ride Smart-Fast". www.smartbus.org. Retrieved October 8, 2018. ^ "Cell Phone Waiting Area". Wayne County Airport Authority. Archived from the original on February 15, 2012. Retrieved January 10, 2013. ^ Faith, Nicholas (1996). Black Box: Why Airline Safety Is No Accident. Osceola, Wisconsin: Motorbooks International. pp. 157–158. ISBN 978-0-7603-0400-6. ^ "9 Killed in Detroit Plane Crash". Chicago Tribune. March 5, 1987. Retrieved January 10, 2013. ^ "Accident Description: Northwest Airlines Flight 255". Aviation-safety.net. August 16, 1987. Retrieved January 10, 2013. ^ "The Crash". Flight255memorial.com. Retrieved January 10, 2013. ^ "Accident Description: Northwest Airlines Flight 1482". Aviation-safety.net. December 3, 1990. Retrieved January 10, 2013. ^ "Accident Description: Northwest Airlines Fight 299". Aviation-safety.net. December 3, 1990. Retrieved January 10, 2013. ^ "Accident Description: Comair Flight 3272". Aviation-safety.net. January 9, 1997. Retrieved January 10, 2013. ^ "U.S. Security for Air Travel Under New Scrutiny". MSNBC. December 28, 2009. Retrieved January 10, 2013. Wikimedia Commons has media related to Detroit Metropolitan Wayne County Airport. Wikivoyage has a travel guide for Detroit Metropolitan Wayne County Airport. 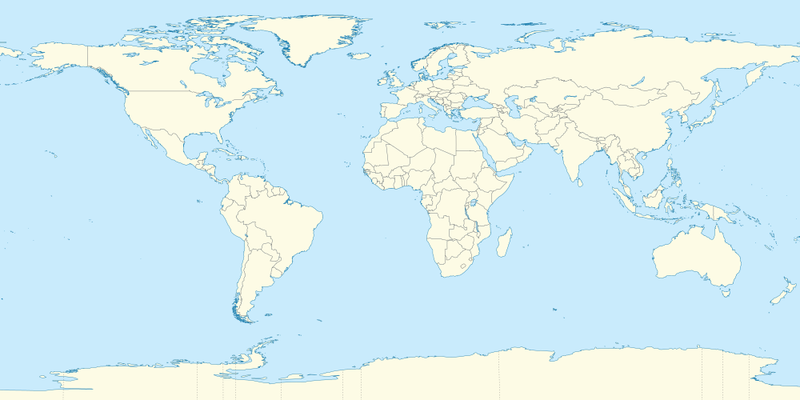 This page was last edited on 24 April 2019, at 14:22 (UTC).